The Aruban florin and the Aruban economy are both closely tied to the US. The florin is pegged to the USD and the economy is reliant on tourism. Despite these ties, and historic links to the Netherlands, Aruba has its own unique culture and history that is as colourful as its currency. As part of the Netherlands Antilles, the Dutch guilder circulated in Aruba during much of the 1700s. It was subdivided into 20 stuiver. In 1794 the Curacao reaal was minted for the use across the Netherlands Antilles and the guilder was officially discontinued in the area (but continued in the Netherlands until 2002). From 1799 to 1828 the Curacao reaal circulated at an exchange rate of 6 stuiver to 1 reaal and 3 ⅓ reaal to 1 guilder. After a short hiatus the guilder was reintroduced in 1828, however it was now subdivided into 100 cents rather than 20 stuiver. When WWII broke out the Netherlands were quickly overpowered by Nazi Germany and the Curacao guilder’s peg to the Dutch guilder was broken. A new peg, this time to the USD, was introduced that same year at a rate of 1 USD = 1.88585 guilders. In 1952 the Curacao guilder was officially renamed the Netherlands Antillian guilder to better represent the currency’s use across the region. In 1971 the Antillian guilders peg to the US dollar was adjusted to a rate of 1 USD = 1.79 guilders. 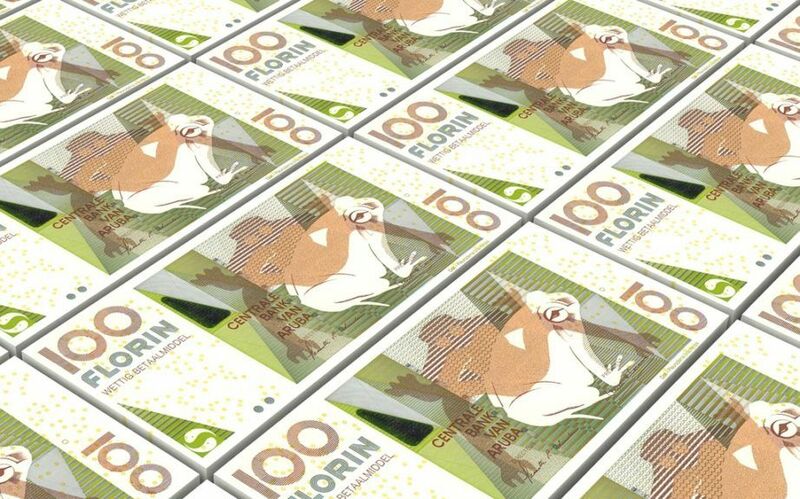 Fifteen years later Aruba separated from the Netherlands Antilles and introduced its own currency: the Aruban florin. It was introduced at par with the guilder. The guilder remains in use in Curacao and Sint Maarten. Although the official pegged exchange rate is 1 USD to 1.79 florin, it is most commonly exchanged by locals at a rate of 1 USD to 1.75 florin. The original banknotes were issued in denominations of 5, 10, 25, 50, and 100 florin. 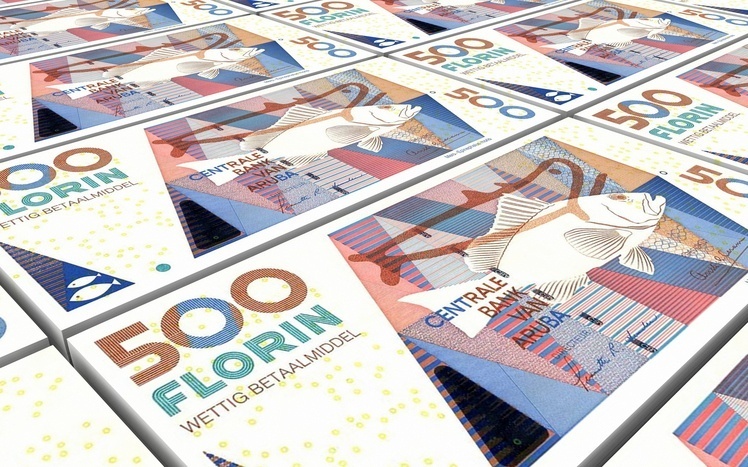 They were updated in a more colourful style in 1990, and a 500 florin note added in 1993. The 2003 series is the most recent. 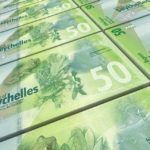 All of the new notes contain colourful geometric shapes with local fauna. Coins were introduced to Aruba in denominations of 5, 10, 25, 50 cents, and 1 and 2 ½ florin in 1986. The 5 florin banknotes was eventually replaced by a unique square coin and the 2 ½ florin coin was withdrawn. The square 5 florin coin was short lived and replaced by a round gold coin in 2005. Aruba has large oil refining and offshore banking industries. A lack of arable land has meant that the island never had a substantial agricultural sector but aloe, livestock, and fishing all exist. Aruba also exports machinery, art, collectibles, and electrical equipment. The dominant industry is, as you would expect, tourism. The tourism sector also drives the construction industry. Services make up 66% of Aruba’s GDP. Unemployment is 6.9% but GDP growth is a healthy 2.4% and inflation is just 0.5%. 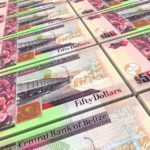 The Aruban florin is pegged to the American dollar and the Aruban economy is, in a sense, tied to the US economy. Tourism, particularly American tourism, is vital to the country’s economic future. As long as both the US dollar and US tourism to Aruba remain strong then so too will the Aruban florin and the Aruban economy. Discover Aruba with our Profile and Travel Guide!